The Spanish Civil War, usually seen as a conflict between irreconcilable ideologies, emerges in J. L. Bautista's sensitive novel as a simple struggle for survival among ordinary Spaniards battered by bombs, hunger, and merciless fate. The reader engages with unforgettable characters�"she was little, but she shook her fist at the sky"�whose resilience and dignity affirm a timeless spirit. "An impassioned examination of the reasons for, and the consequences of, the Spanish Civil War. Told through the eye and the ear, and from the heart of, a woman. A woman you will want to honor. This is perception and narration of facts and feelings you will never find in history classes. Or in Hemingway." Like its central character, the tenacious Senora Rosa, The Road, and Nothing More is spirited, no-nonsense and wry. J. L. Bautista’s epic depiction of the Spanish Civil War and its aftermath, told from the street-level view of housecleaner Senora Rosa, enfolds a family, a neighborhood, and a country, and breathes life into dark days without ever losing its hold on optimism and its sense of humor. This may seem strange to say about a novel on such grim subject, but with such compelling characters and hardy prose, reading it was a true delight. In 1931, the Second Spanish Republic and Rosa Laura are born, a mother and daughter story of ensuing civil war and the iron rule of Franco. The scent of orange blossoms in the heat of the day. An idle flirtation, the growl beneath the surface. 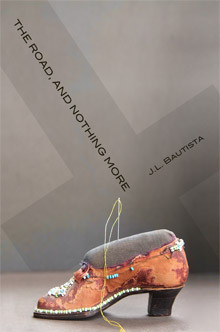 J. L. Bautista promises a world of remembrance and, by the end, delivers an overflowing cup of life. The Spanish Civil War has dashed the city of Madrid into chaos. The hardworking Sra. Rosa must save her family. From this urgent premise comes a sweeping, passionate multigenerational novel; a woman-based epic of betrayal, innocence, passion and murder, told with relentless realism, yet also lightly presented and endearing, with hints of Marquez. As Spain turns to socialism, The Road leans heavily upon its women. The men play out either as hopeless brutes, or two who are gentled by their differences: one blind, the other gay. During wartime, the elite are churned under, the workers rise up, and the social shrapnel flies. Yet throughout, weary diners might still seek out a Spanish omelet and a sip of wine. The reader should also stock up on food for The Road, because this book is almost impossible to put down. J.L. Bautista's absorbing tale, The Road and Nothing More, is set in Madrid during the Spanish Civil War of the 1930s, and the dictatorship of Franco and his fascist enforcers. It is the story of ordinary people whose neighborhoods have become battlefields and whose homes, once humble places of refuge and peace, have become targets of brutality and bombing. The heroine of Bautista's story is a poor woman of extraordinary moral strength and courage. Childless and abandoned by her husband, Rosa adopts a newborn girl whose mother has died giving birth. The girl is named Rosa-Laura, honoring the mother who bore her as well as the mother who will raise her with perfect devotion. The cast of characters is splendid: Rosa's hard-scrabble family; the family of the wealthy and good-hearted doctor for whom she keeps house, and confidences; Franco's minions and assassins; and the perpetrators, opportunists and victims who stride or slither through the story. After the richness of the characters, perhaps the thing I liked best about The Road, and Nothing More is that this is a story of the best of human beings persisting against the worst, regardless of how unequal the battle may be, or how unlikely a victory. Political systems come and go, some better than others, some atrocious. But perfect love engenders perfect trust. At the end of the story, Rosa-Laura, grown and a mother herself, recalls the time during the war when she was separated from her mother. "I counted the things I would do when she came to get me. I knew she would come." I am not usually a "war novel" fan. This is something much more. Recipient of the 2005 George Garrett Prize for fiction, J.L. Bautista is the author of the story collection Fiestas.